Totally Frenched Out: Ouigo or no-go? I'm out in the countryside all week for work, and I took one of the new Ouigo trains from Montparnasse to get out here. If you haven't heard of it yet, the SNCF advertises Ouigo as the "new high-speed, low-cost trains". Up until a few months ago, the Ile de France departures only left from outside of the city, but they started offering routes from Montparnasse last November. There are a few things to know though before you go - like they recommend showing up 25 minutes before the departure. This is for several reasons - 1) the trains leave from the Hall Vaugirard, which is a good 10 minute walk from the metro. 2) You need to have your ticket validated (and show ID) before you are allowed to enter the boarding area. 3) The size of your suitcase will be verified, similar to when flying a low-cost airplane in Europe. This last one got me today - I have a small red suitcase that used to be an acceptable carry-on size, but that no longer fits today's standards. It's still small though, and I figured it would pass, but wrong! They had folks verifying everyone's baggage prior to boarding, and the suitcases had to fit into that little rectangular box airlines use. They were also measuring people's handbags with a ruler. Poor little reddie missed the mark by a few centimeters, and I ended up having to pay the 20€ baggage fee. Always a joy at six in the morning, let me tell you! Next, there's the inside of the train. In order to get more bang for their buck, they have made the previous two seats into three seats and they don't recline. It's a lot less comfortable than your standard TGV, but it's doable for shorter trips. There's also no bar car, so you have to stock up on your own food before you go....and then keep all the trash with you because there are no more trash bins in the cars (only near the toilets). There is a small workaround though for the seats - if you pay 2€ extra, you can get a seat with an electrical outlet, and those all appeared to be two-seaters. And if you need more than a carry-on, pre-paying your luggage costs only 5€ in advance instead of the 20€ I paid at the station. A few upsides of this low-cost service? Tickets start at 10€. For my trip, I paid 19€ for the Ouigo, and a regular TGV train for the same route departing a few minutes later cost 60€, 3x the Ouigo price. 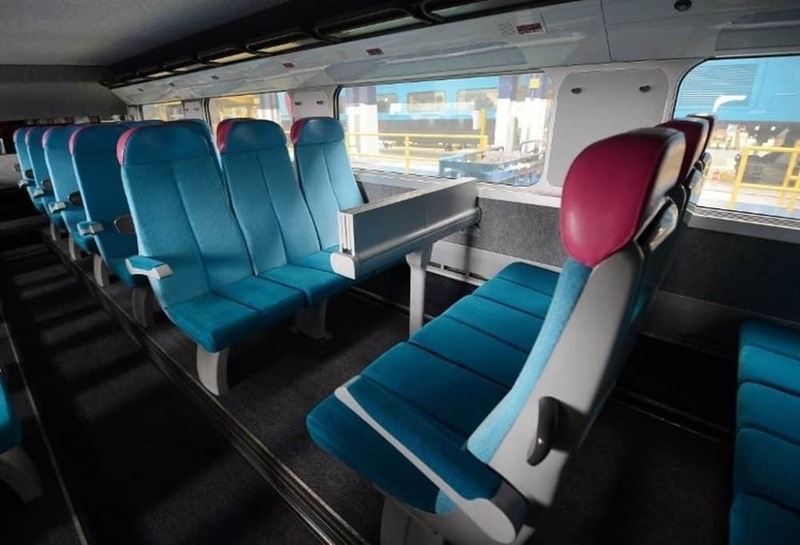 The Ouigo trains also have staff on-board to regularly clean the bathrooms, there's no weight limit for luggageand a big perk for families is that kids under 12 can travel with a paying adult for a flat fee of 5€. I've taken Ouigo a few times now. I've never seen the three seats! All the ones I've been on have been the same size inside as regular TGVs except with less baggage space. Last time I took it was in May which admittedly is awhile ago, but still.... It must depend on the train line. I've only done Lyon-Tourcoing (Lille). I've only ever taken a backpack or just a purse, so no comments on the luggage restriction. 10 or 20€ for a trip and less than 50€ AR was so much better than around 100€ just for an aller simple with the regular Lille-Lyon TGV. Before we moved, I spent so much money on tickets while coordinating our move as the Ouigo's times didn't work out (only one train a day). Pre-planning before travelling is a better choice.